9' 3" high, 3' 4" across the front and 8" thick at the sides. 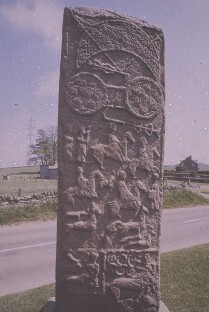 General view of the back of the slab, divided in to three panels containg the crescent and a v shape at the top, below it are a double disc and a Z shape, beneath the symbols is a hunting scene with 4 riders and 3 men on foot, two with hunting horns. On the right side of the slab is (David?) tearing the lion apart, with a sheep and a harp above him to designate David as shepherd and harpist.